Club Penguin Cheats by Mimo777 Club Penguin Cheats by Mimo777: Chattabox's Digloo Adventure! 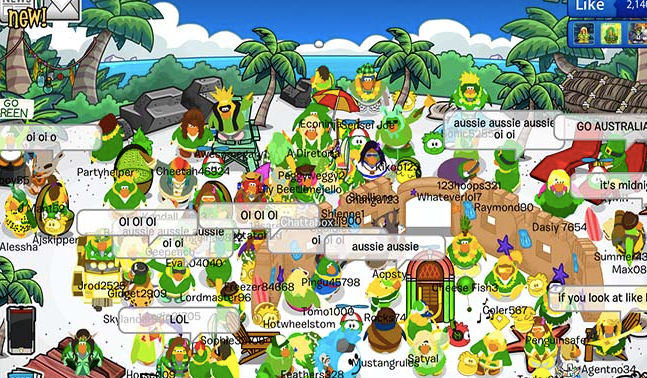 We had such a rockin' Australia Day Party last week – I was so excited to see everyone dressed up in their outfits chanting "Aussie Aussie Aussie". You were all totally awesome! This week I've been spending so much time at the Prehistoric Party – have you all been collecting your Dino Puffles? I love my new Blue Dino Puffle – I've named him DinosaurAUS. At the moment he's hanging out with my pink Puffle 'Lil Aussie' in my new amazing backyard. Have you all filled yours with Puffles yet? Every week I like to try and visit all of your igloos, so why don't we have a party where we visit each others igloos and dig for eggs? Make sure you have your Dino Dig Site in your igloo and maybe we'll come and visit your iggy! Also, don't forgot to come dressed up in your epic caveguin outfits – they are so cute! Hope it's a good time!